Take this old peacoat, absolutely classic, but also extremely boring! It’s been hiding away in my closet for awhile. I’ve been searching all season for replacement, but have yet one that fits quite as nicely. But this old one here, fits just lovely. 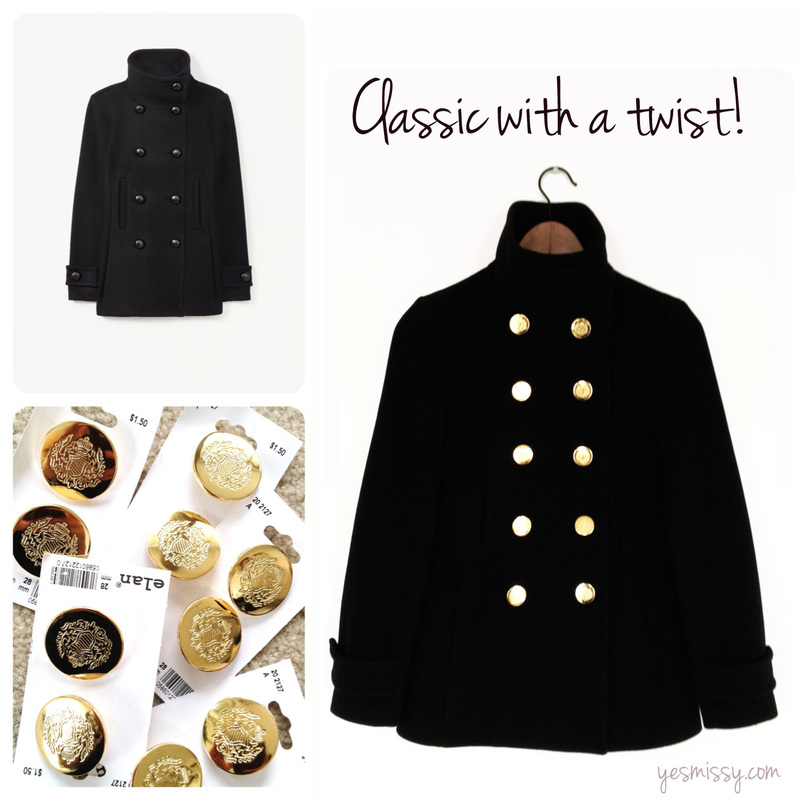 This peacoat needs something to make it fab all over again. So how about some shiny, new buttons?! Buttons are actually considered a part of your accessory count, think of how rings, necklaces, watch, bracelets, earring actually set the tone and character of an outfit. Buttons are a key embellishment that ability to easily change the look of the jacket or coat. An ensemble can take on a whole new life with this simple trick. I’m looking to create a chic, polished, yet unique look. So I’ve decided to go for some eye catching bright gold embossed buttons. Faux fur has been such a huge trend this season. It’s an easy way to add warmth and winterize any look. So why not add it to a leather jacket? I’ve added this detachable fur collar to soften the tough look of leather, while creating warms and adding a polished touch to the leather jacket. 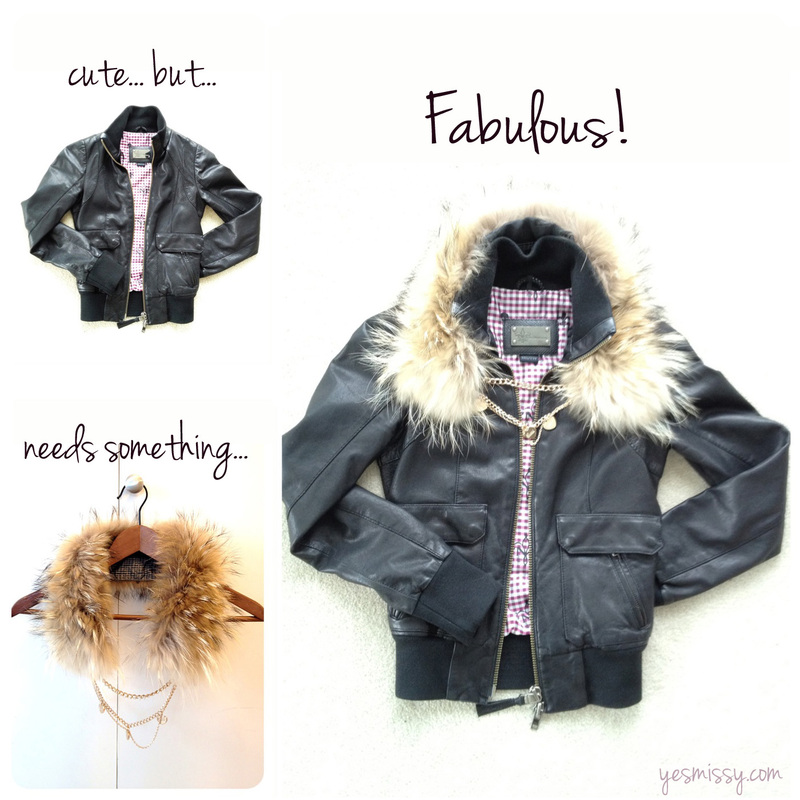 The best part if you can add this fur collar to any one of your jackets or coats for an instantly updated look. "Nail DIY: Paisley Bandana Print Nails"
"Hair DIY: A New Way To Do a Fishtail Braid"
I always change up the buttons on my coats. Love, love this!!!! I think I may need to get in on this button action. Great way to up-cycle! Love the fur collar too. Why thank you! Glad you like my blog. I’ll definitely check your blog out too! 🙂 I still have to figure bloglovin out haha. I signed up a little while ago but I haven’t made much use of it.